Home What's new at Nancy K. Brown? What's new at Nancy K. Brown? - bring professional nail care home, for beautiful nails everytime ! - Hand Rescue Salve is now available in travel / purse / pocket size 30ml / 1oz - for easy use throughout your day ! - Read about ROSACEA - what is it? what to do? Nancy K Brown has innovative approaches for the various different kinds of Rosacea- to provide management for and give relief from the different forms of this frustrating skin condition ! See Rosacea here for answers and product solutions ! - Read about ECZEMA - what is it? what to do? Nancy K Brown has an innovative approach - to provide management for and give relief from this most irritating skin condition ! See Eczema here for answers and products ! Nancy K Brown is delighted to share with you the unbaised, unsolicited independent review by Anita of IntensePolishTherapy of the Nancy K Brown Skin Care Acne System. Nancy K Brown has again renewed its support for 2014 / 2015 for the Humane Society and the wonderful work the society and its volunteers do for animals in Greater Edmonton area. Nancy K Brown is delighted to share with you the launch of MOISTURIZING FLUIDE our exciting new face care product, many years in the making, ready just before the cold season - fall and winter - to help you get and maintain great skin. GET YOUR BODY, FEET and HANDS READY FOR FALL and WINTER - with Nancy K Brown body, foot and hand care products. 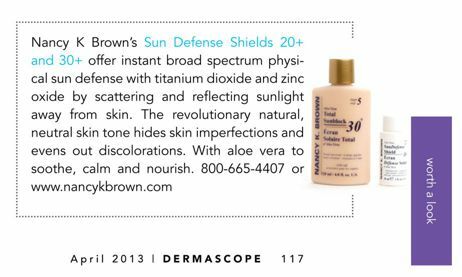 Nancy K Brown is featured in the April 2013 issue of DermaScope Magazine, one of the world's leading skin care publications. Nancy K Brown introduces a new size for the popular Acne Prone Skin Mask - now also available in 60 gram / 2 oz size. Visit our new Facebook page and like us. Share your experiences with Nancy K Brown and Nancy K Brown products with the world - your opinion counts - go to: Nancy K Brown Facebook. at Nancy K Brown we have offered our clients a choice of Beauty Balms, Blemish Balms or Beauty Benefit for years - namely the Sun Defense Shields. Unlike the 'fashionable' BBs recently touted in magazines the Nancy K. Brown Sun Defense Shields offer far more functionality and a variety of choices at a much more economical price. See Skin Care - Step 5 (Sun Defense Shields and Moisturizers) for details. Have you felt the need or burning desire to send your skin care company a thank you note lately? For their products, service, education or any other reason? for me and I really appreciate it ! experience the satisfaction L.W. is. RESULTS - you never dreamed possible !